Since his arrival in 2005, Kim has contributed to the MIT community through his exceptional research and commitment to undergraduate education and advising. 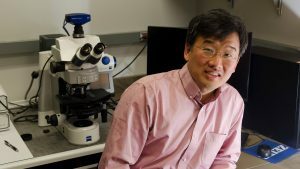 Dennis Kim, the Ivan R. Cottrell Professor of Immunology, is leaving the MIT Department of Biology at the end of this semester to serve as the Chief of the Division of Infectious Diseases at Boston Children’s Hospital. Kim has been a member of the department for 13 years, serving as the Biology Undergraduate Officer for the past four years and Chair of the Committee on Prehealth Advising for the past six. Kim became enthralled by basic science as an undergraduate at the University of California, Berkeley. There — in the cold and in the dark — he performed light- and temperature-sensitive experiments under Ken Sauer to understand the mechanism of water oxidation and oxygen evolution in plant photosynthesis. He traces his commitment to undergraduate education back to these formative experiences in the lab. Although he was already planning to attend graduate school, a run-in with a car on his motor scooter and a broken femur ignited an additional passion: human health. As an MD-PhD student at Harvard Medical School, Kim had the opportunity to explore both avenues. There, under the mentorship of Chris Walsh, he studied enzymatic reaction mechanisms in bacterial cell wall synthesis, cultivating an interest in infectious disease that he pursued during his clinical training. Later, as a postdoctoral fellow at Massachusetts General Hospital, Kim and his advisor Fred Ausubel, with help from Gary Ruvkun, worked to understand host-microbe interactions with a focus on innate immunity in a simple animal host, the roundworm Caenorhabditis elegans. Together, Kim and colleagues carried out a forward genetic analysis of host defense against pathogen infection in C. elegans, which eventually laid the foundation for his work as an independent investigator. Kim arrived at the MIT Department of Biology in 2005, and since then has felt continually inspired and supported by the community. For all thirteen years, his lab has been located next door to Nobel Laureate H. Robert Horvitz, who also works in C. elegans. Over the years — and “thanks to some really terrific graduate students” — Kim has discovered molecular pathways governing how C. elegans recognizes and responds to its microbial environment, with a more recent emphasis on understanding how bacterial metabolites can influence host animal behavior. Questions like these are particularly well-suited to C. elegans, given its simplicity, defined nervous system structure, and well-established genetics. In addition to his achievements in the lab, Kim has been a passionate advocate for undergraduate education. He’s been the Department of Biology’s Undergraduate Officer for four years, working at the departmental and institutional levels to develop and implement initiatives related to campus life, educational programs, and the curriculum. He has also chaired the Committee on Prehealth Advising for the past six years and worked to help MIT undergraduates gain admission to competitive medical schools. During his time at MIT, Kim developed a new subject, 7.26/7.66 (Molecular Basis of Infectious Disease), which provides an overview of viruses, bacterial pathogenesis, and parasites to advanced undergraduates and graduate students, respectively. Kim also recently worked with the Biology Undergraduate Committee and colleagues in the Department of Chemistry to develop the new 5-7 (Chemistry and Biology) major. “I am delighted that there are a number of students who are very enthusiastic about the major and are well-prepared to work at the exciting interface of these traditional disciplines,” he says. Kim has served at the Institutional level, chairing the Committee on Curricula and serving on the Committee on Nominations, and maintained a part-time clinical instructor appointment at Harvard Medical School. Of his numerous pursuits, Kim has found working with the undergraduates and graduate students to be the most rewarding. As Kim transitions to his new position as Chief of the Division of Infectious Diseases at Boston Children’s Hospital, it will take three people to fill his shoes as Undergraduate Officer and Prehealth Advisor. Adam Martin and Catherine Drennan have agreed to share the role of Undergraduate Officer, and Matthew Vander Heiden will co-chair the Committee on Prehealth Advising. What will Kim miss the most about MIT? That goes without saying: his students.